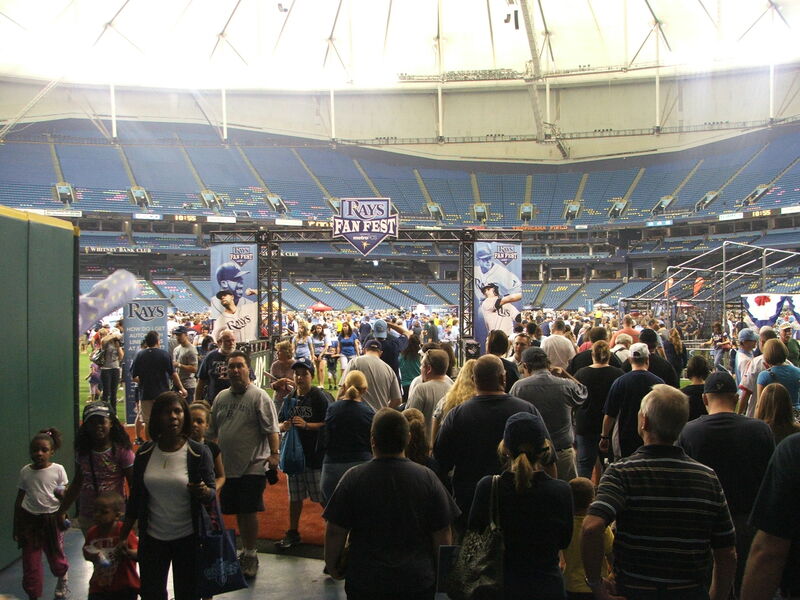 Every time I head out for the Tampa Bay Rays Fan Fest in the middle of February, I head out with a renewed vigor and vitality for the expectations and the anxious excitement of the upcoming season. Well, if the sight I saw at 8 :45 a.m. is any indication of the community support for the team in 2009, the rest of the league will not see a huge amount of blue seats during the ball games. 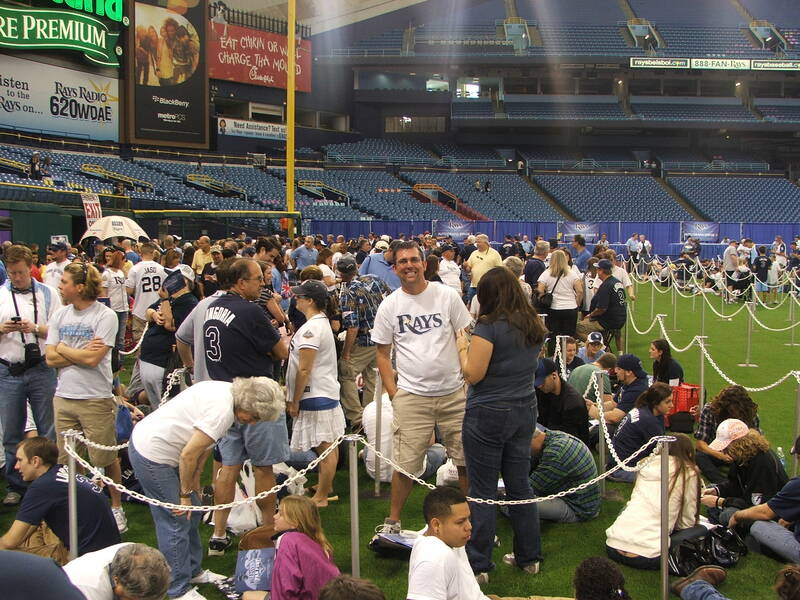 I know it is too early to even imagine over 2 million fans in the seats at Tropicana Field, but that is what today is all about………dreaming of the future and celebrating the good fortunes of 2008 with 35,000-40,000 of my closet Rays fans. I seriously did not expect to see over 4 ,000 people standing in line outside waiting for the 9a.m. Season Ticket holder opening when I pulled into Lot 6 off of 1st Avenue South in St. Petersburg. I also did not expect that most would be as excited as me to the possibilities of the coming year, and wondering who might sign, or not sign inside today. 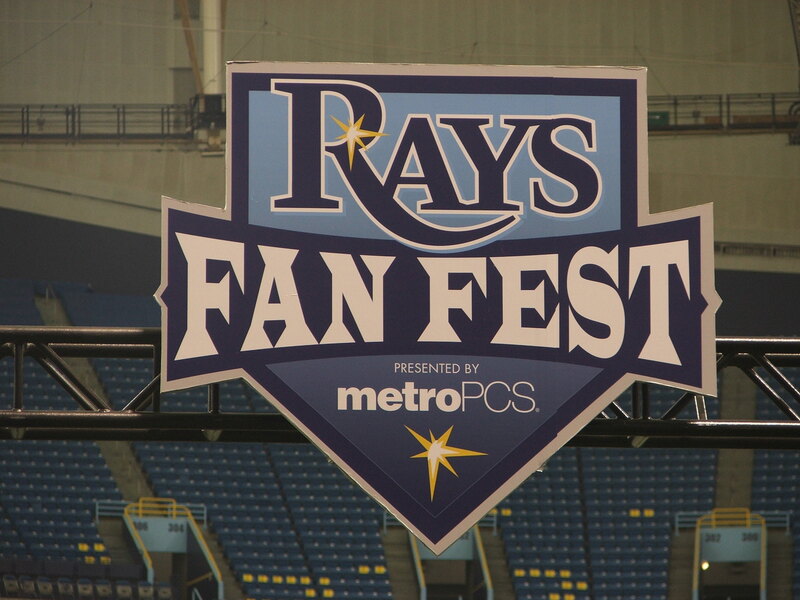 From the moment they left us in early to be able to a few circles around the field and check out the sights, it was by far the best Fan Fest that the Rays have put on in their short history. Kudos go out to Mark Fernandez and Brian Killingsworth for the awesome display booth and sights that greeted your eyes when you first walked into the stadium in center field. 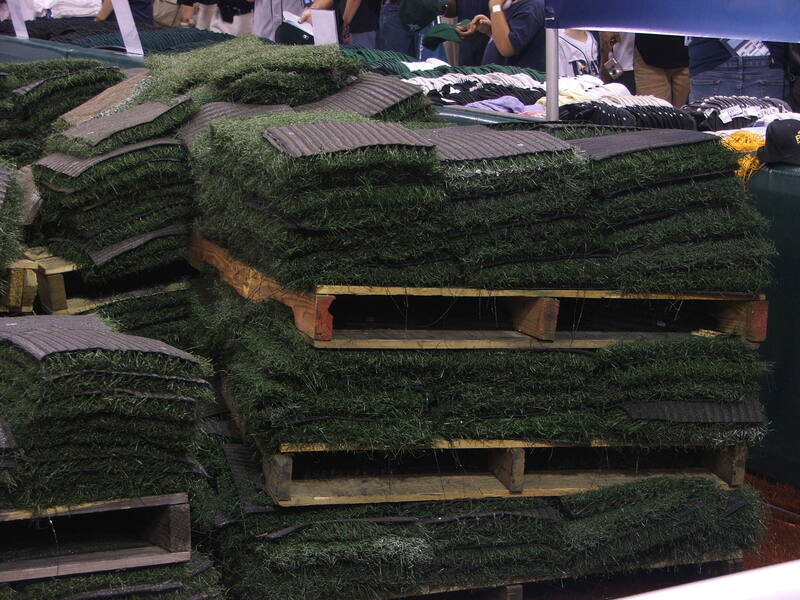 Some people just love to be able to walk on the Field Turf, but if you have been a Rays fans for years, you know the turf can be a bit hard on your legs after a few hours. 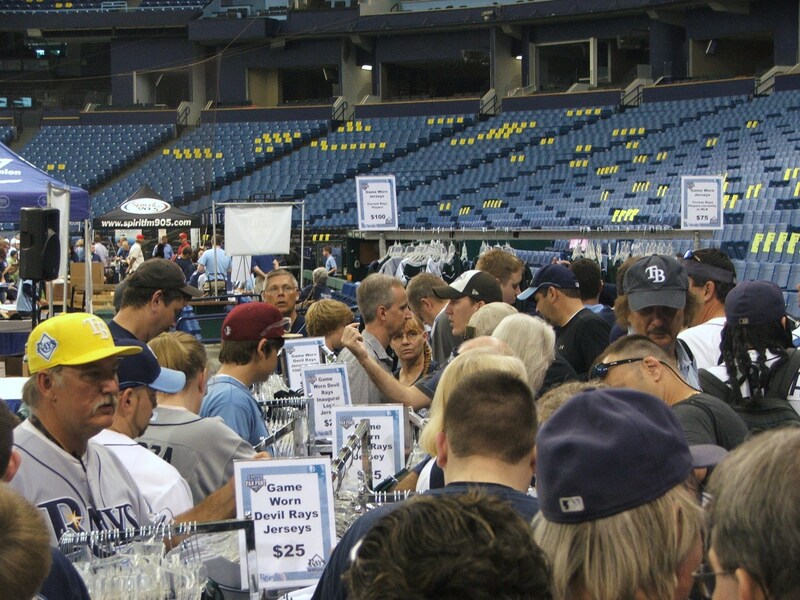 The sights that first hit your eyes is the grouping to the left that featured several of the Rays big time sponsors who gave away free items for fans in attendance. 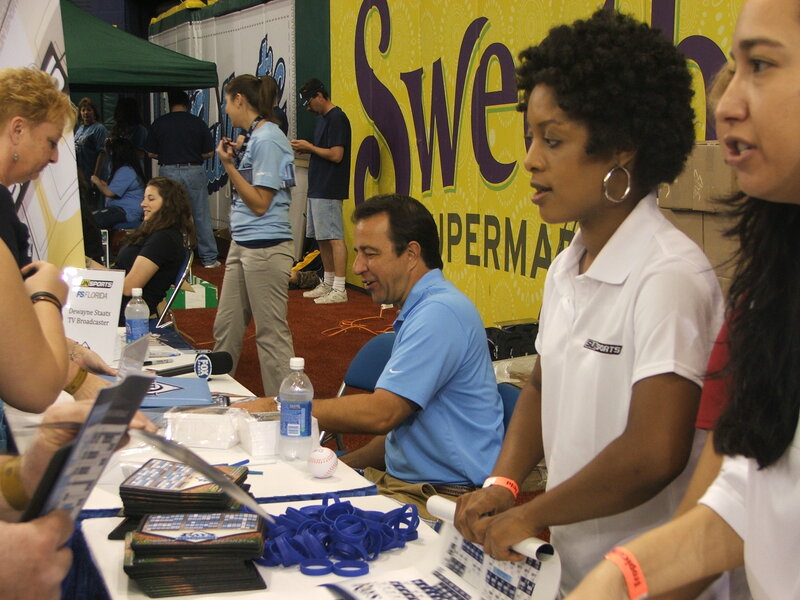 There were the free Rays 2009 TV schedule poster by Florida Sports Network ( FSN ) that also featured several members of the Rays Television crew signing for the fans. Then you had a booth set up for famous Nathans Hot Dog Champion Joey Chestnut, who is a two-time champion of the annual Nathans event now. 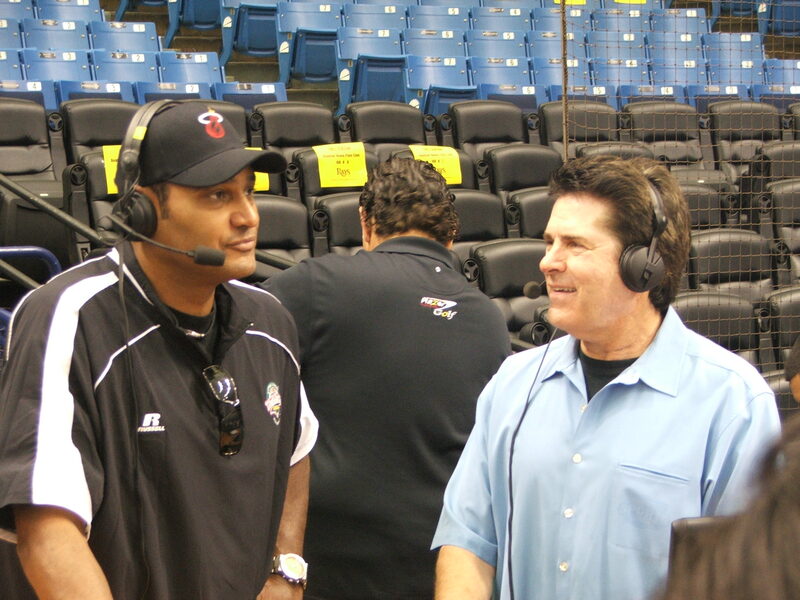 Later in the day, Rich Herrera, who does the pre and post game shows for the Rays challenged Chestnut to drink a gallon of milk without spilling or………. Chestnut downed the gallon of milk in under 45 seconds, and came up smiling to the crowd. 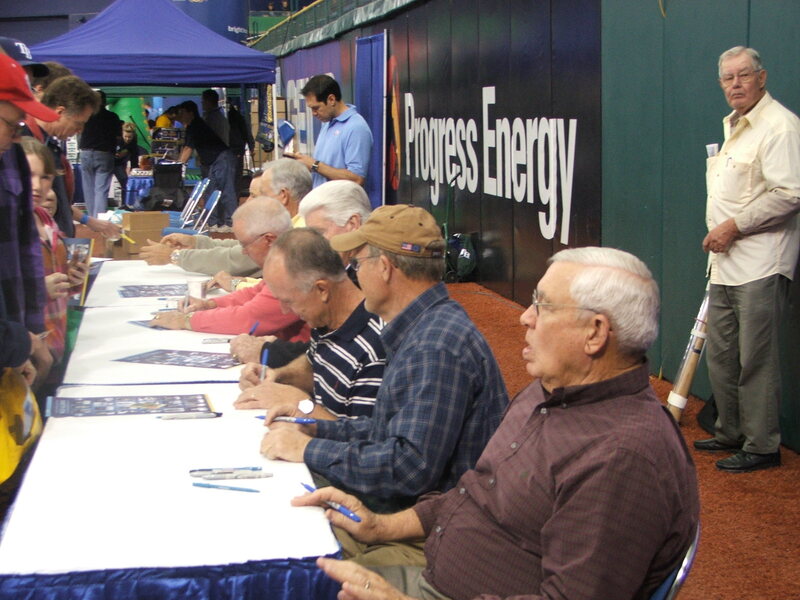 Then down near the right field corner you had a booth set up for the Major League Baseball Players Alumni Association. 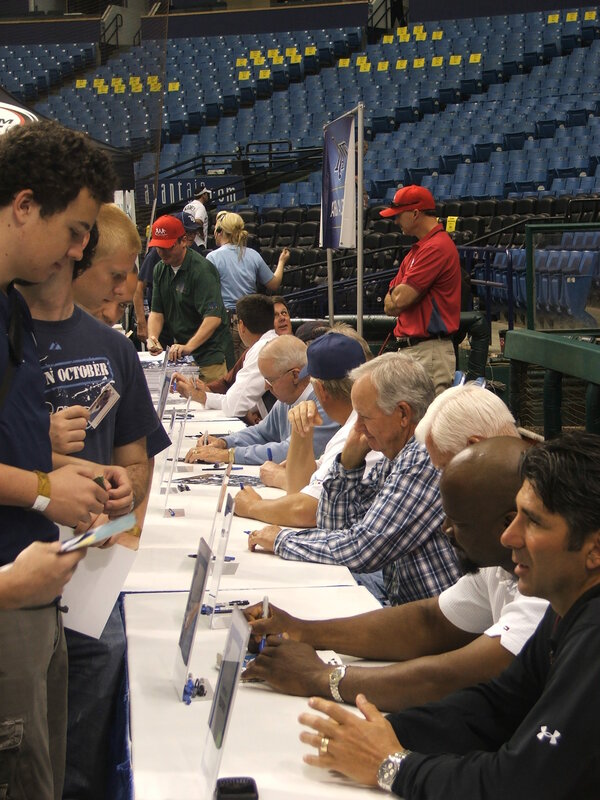 They presented such former stars as ex-Rays Doug Creek, Billy DeMars, Bill Denehy, Joey Jay abd Tom Neidenfuer to the fans for questions and autographs. A few hours later, former greats like, Wayne Garrett, Gary Peters, Jim Archer, Darold Knowles, and Mark Whiten also came out in support of the MLBPA event. The place was already a buzz with excitement and it was only 10 am. The autograph lines quickly filled up with Table 1 being the place to be today. 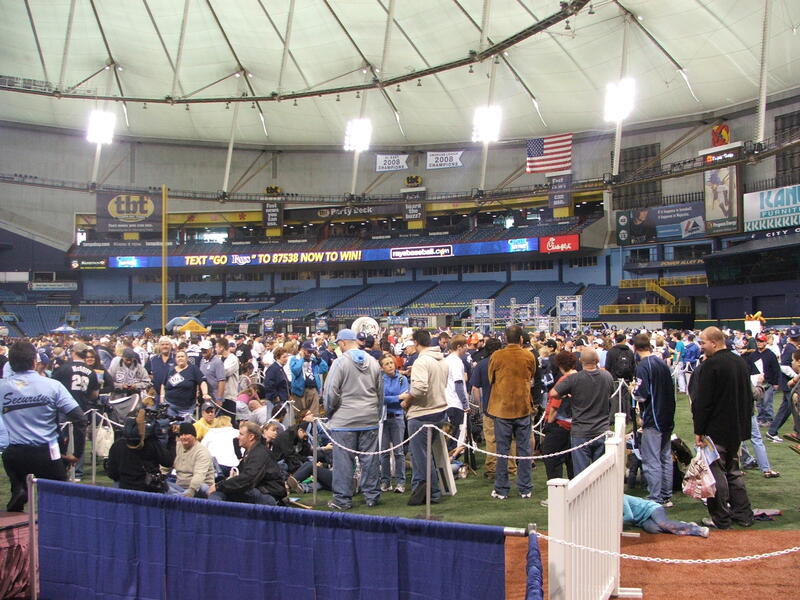 At one point today, the line stretched out the right field gate and swirled into the tunnel under the stands twice to form a line of about 1,000 fans seeking autographs from the players ib just that first table. The first table got the first bit of bad news at about 12 noon when it was announced that Rookie of the Year winner Evan Longoria would not be signing at the event. Rays pitcher James Shields jumped in and rescued the hour by staying and signing for fans in place of Longoria. Rumors quickly spread about the missing Longoria from a family emergency to missing the event because of an autograph contract with a company. I do not know the correct answer, but I will give Longoria the benefit of the doubt unless something else hits the fan. During the signings you could see the Cow from Cick-fil-A and Stewie from family guy going around and chatting with kids and fans waiting in line for autographs. 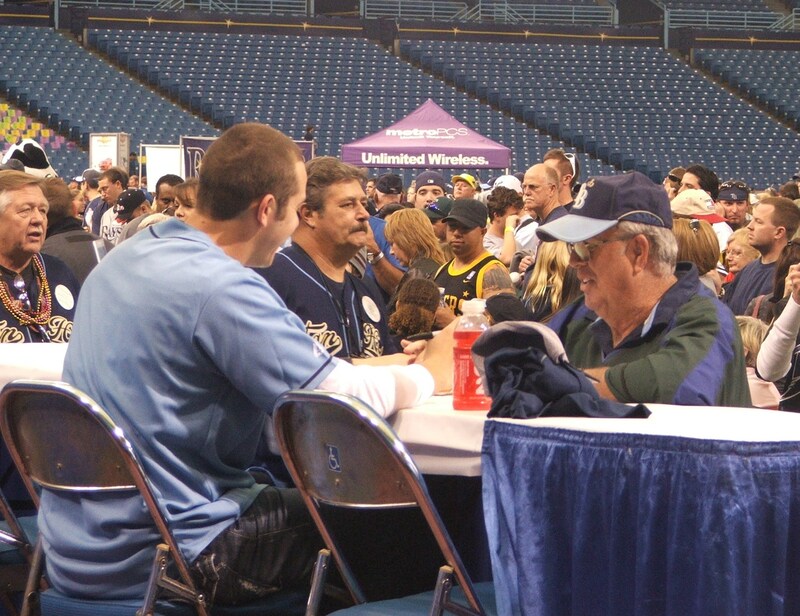 If you left the autograph area and moved down the first baseline, you were met by the Metro PCS table, where from 1-3 pm today, a Rays player could phone someone you knew and chat for a minute or two. I got new Rays Pat Burrell to leave my new voice mail message on my cellphone for my website. 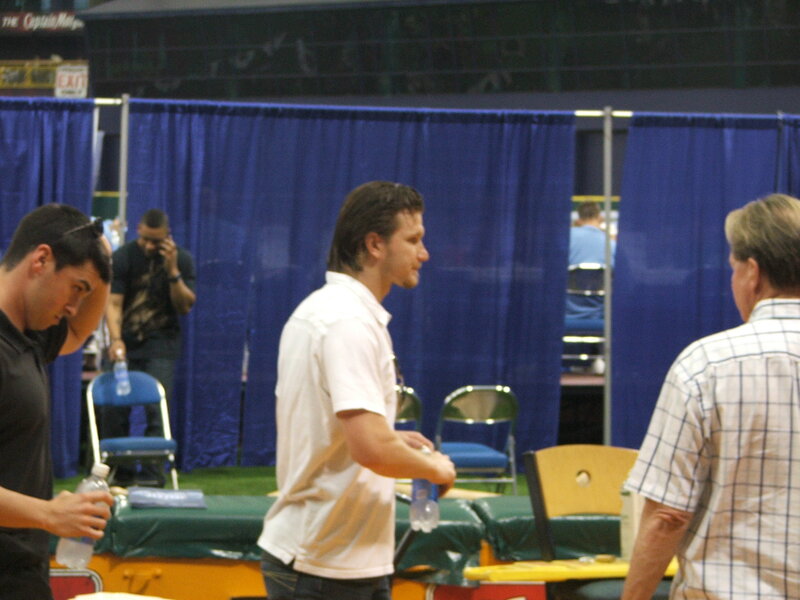 But other players like 2008 first round pick Tim Beckham and David Price were over at the tables during the day. 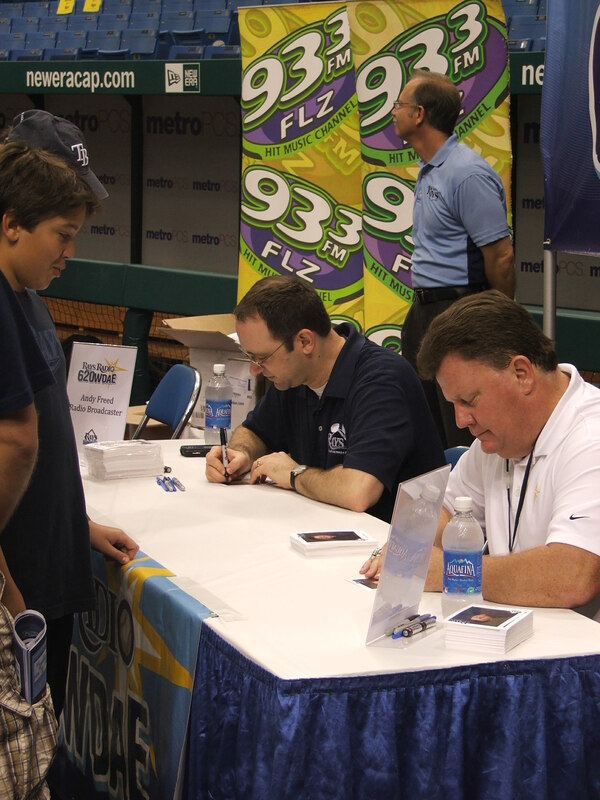 If you kept going to the first baseline, you saw that Chevrolet was out giving Rays fans free gifts and presenting the 2009 models close up and personal. Then you would come up on the Baseball America table where you could sign up to win a special prize from them throughout the day and receive the newest copy of the magazine. the MLB Network also had a small table set up giving away more goodies for the fans and giving them an opportunity to check out the new network that started on January 1, 2009. The Rays Golden Rays club, which caters to its fans 55 and older was stationed right next to them and was taking applications and giving out the 2009 edition of the Golden Rays shirt, which was a striking gold shirt with royal blue lettering. 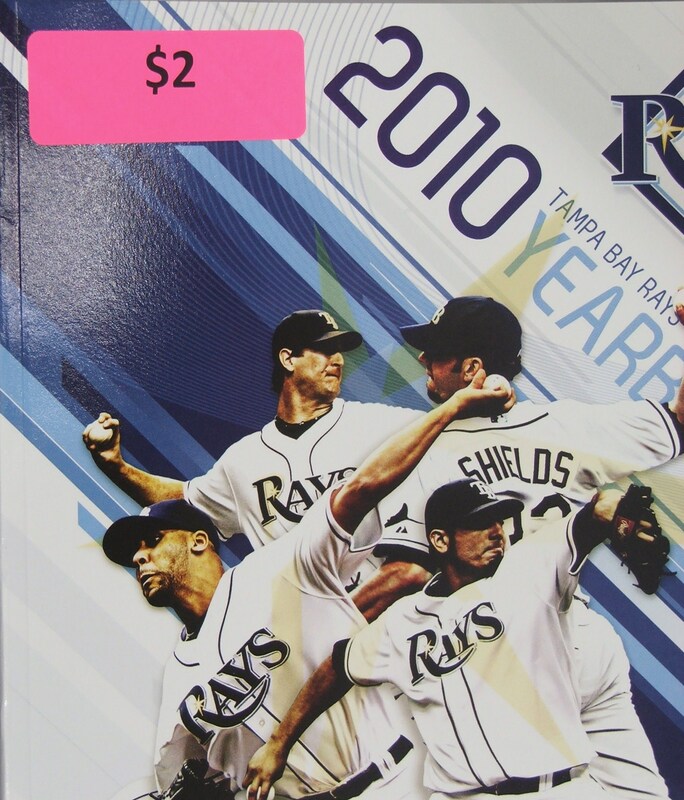 After that it was a smattering of Rays booth featuring the Charlotte Sports Park, where the Rays will be playing their 2009 Spring Training games and hold all training session before the Spring games begin in 2009. 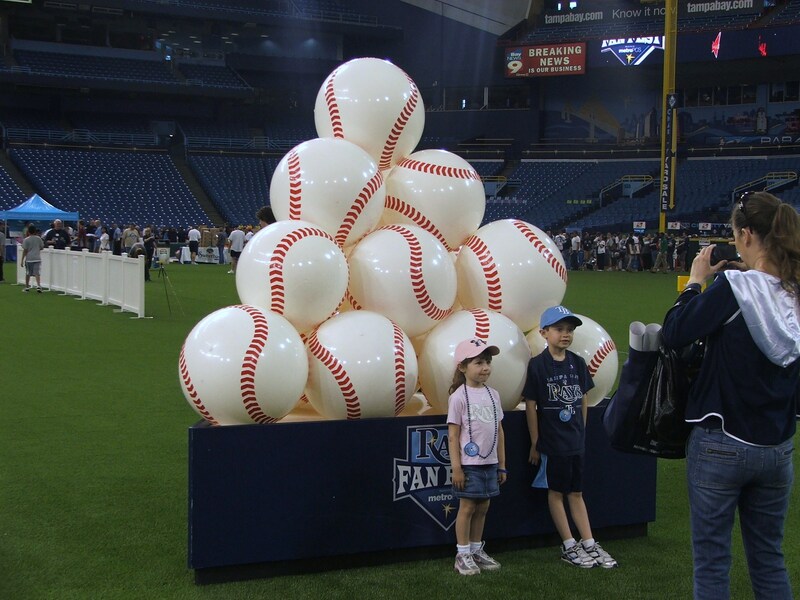 On the opposite side were the Clear Channel radio stations lining the fencing for the “Kids Run the Bases” event that is so popular after Sunday’s Rays games. 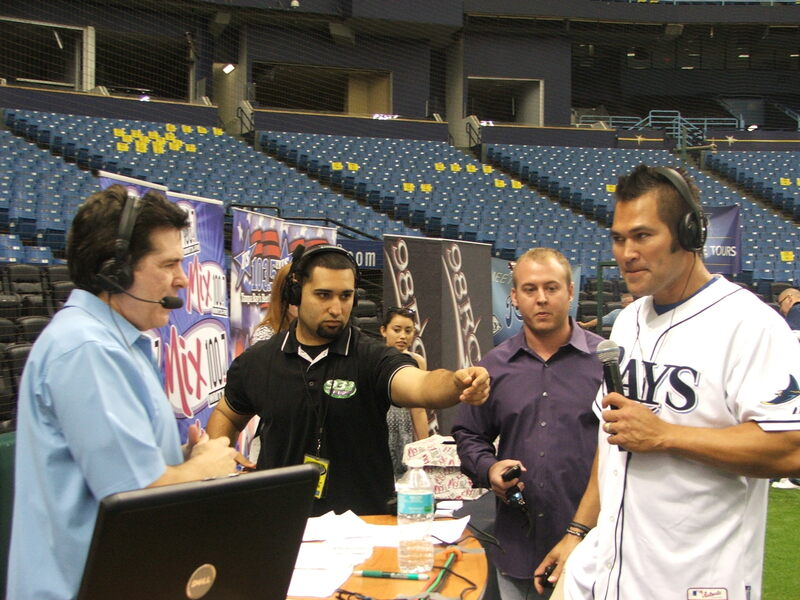 Then you would come upon the Rays Radio Network, which had both their Spanish and English radio teams signing for the fans. Right next to them near the entrance for the Clubhouse tour was WDAE 620, the Sports Animal booth that was broadcasting throughout the Rays Fan Fest event. 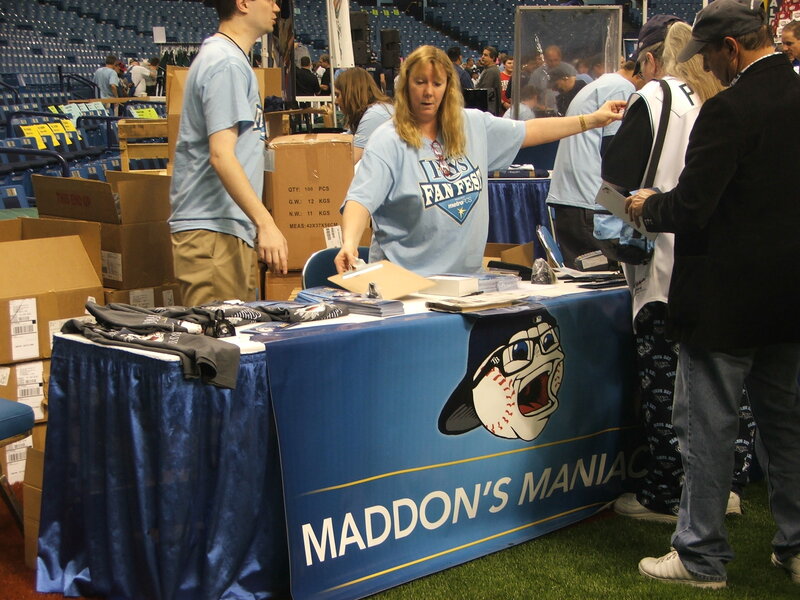 To their right was the Rays Maddon’s Maniac booth that was already taking applications and giving out collectibles for the 2009 season. 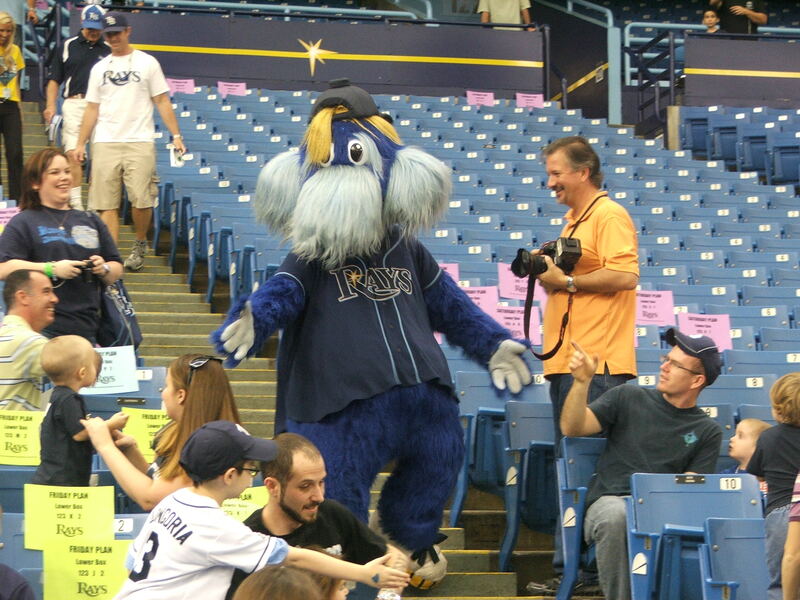 I am going to write a blog in the coming week on the events and the new procedures for this great Rays booster club. After that you had the Rays season Ticket folks and Raysbaseball.com situated right behind home plate to help you with your seat selection, or to view the website on a laptop set up on the table for you to browse the website. 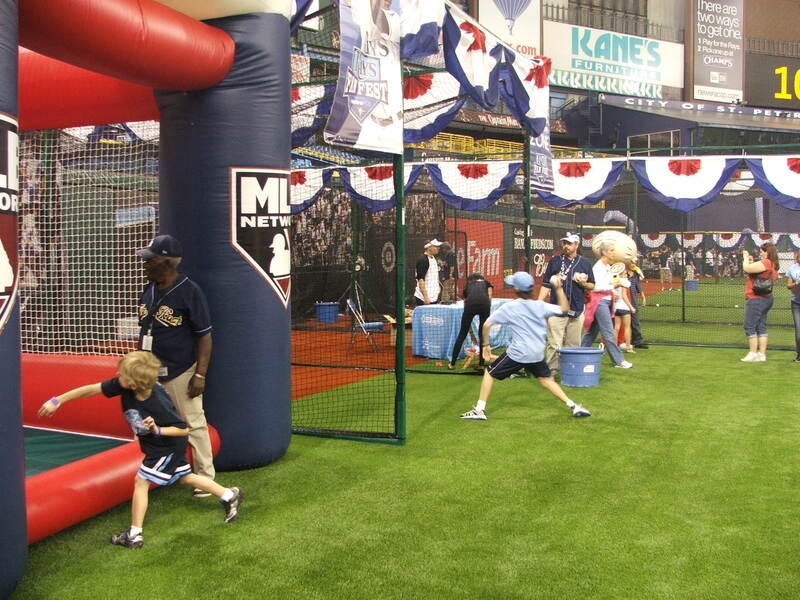 A new item offered this year was an event by Raysworld, which does the in-game entertainment for the Rays games. 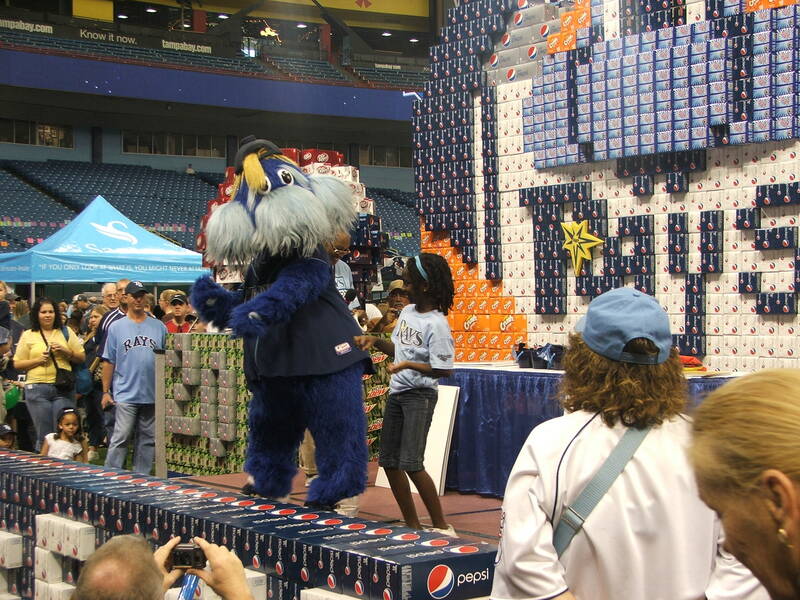 They featured a event where you could do a “shout out” to your favorite Rays player, or give a motivational speech to the team. 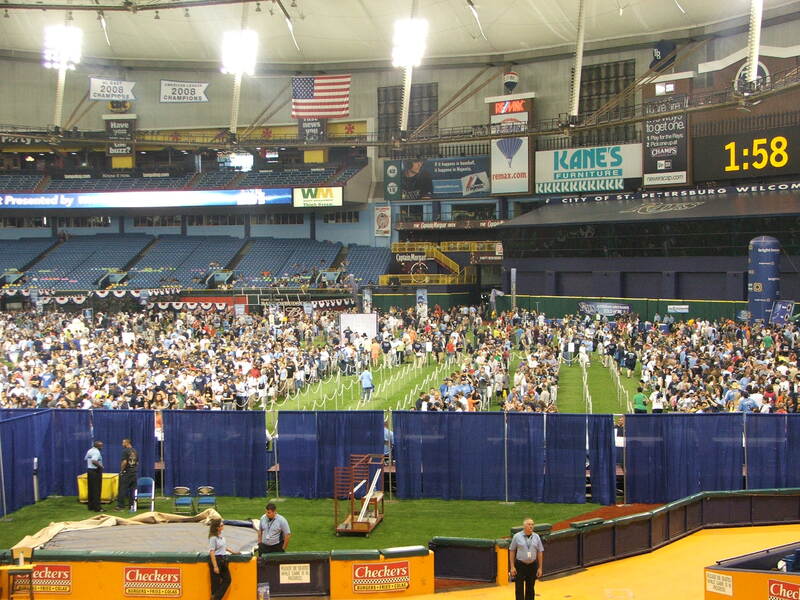 Some of the selected video from today’s taping will be featured on the Jumbotron during a 2009 Rays game. 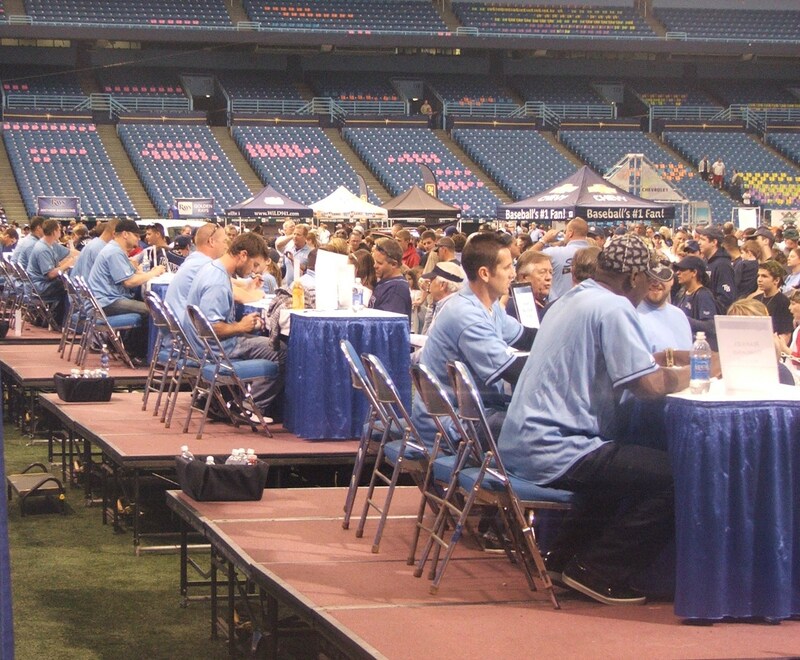 Then you had the world famous Rays Baseball Foundation table which listed silent auction items like a playoff “magical season” package that had items from every stage of the Rays 2008 playoff season. 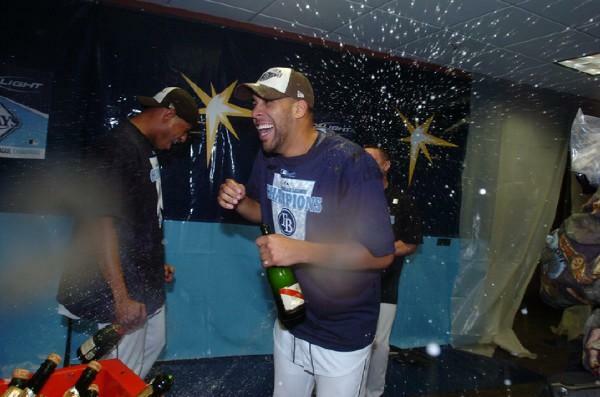 Also up for bid was a team signed champagne bottle with every member of the 2008 Rays team members signing the bottle. 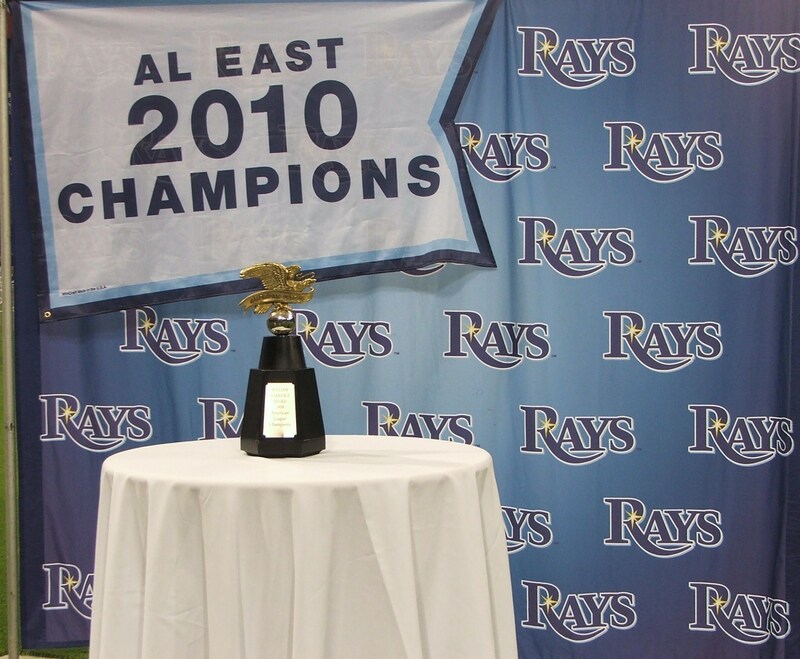 Another item was a chance to be placed within the 2009 Rays Team Photo. I won this one in 2008, and I had a fantastic time that day. 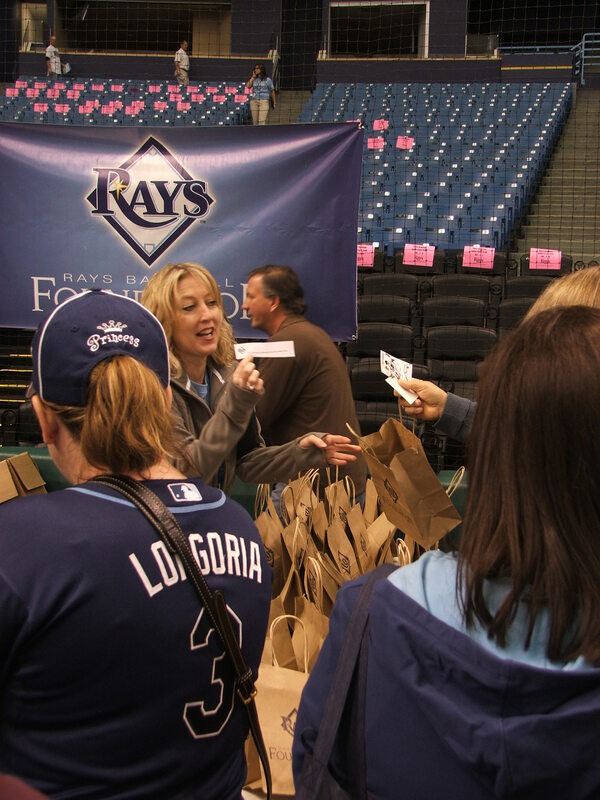 They also provided $ 20 grab bags that included a ball signed by a Rays player, past or present. You never know who you might get………I got a Fred McGriff signed ball today. Strolling down the third baseline you had the Moffitt Sun Safety squad out there giving away free sunscreen to Rays fans. Just a reminder to anyone heading to Port Charlotte. 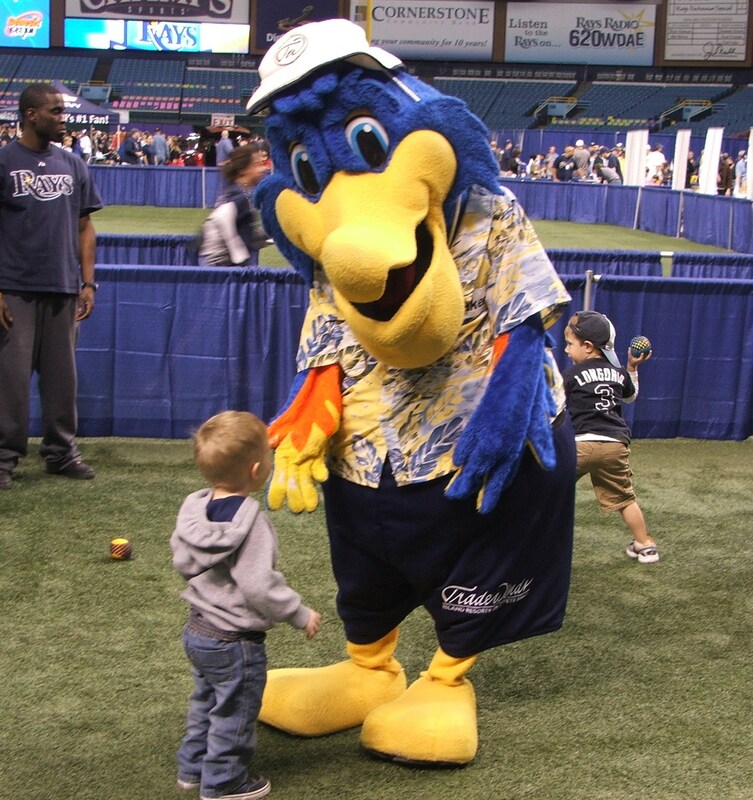 It is not on the water like the Tampa Bay area, so be sure to take sunscreen to the game to combat that nasty red burn on your nose and shoulders this spring. 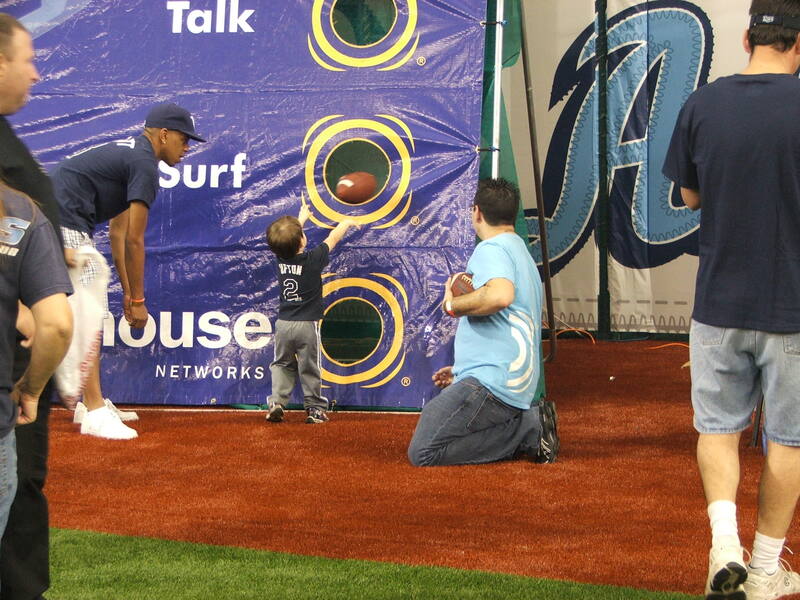 Then you had two very special groups, the Rays Reviving Baseball in the Inner Cities ( RBI ) program. This is a fantastic program, and the Rays All-Star left fielder Carl Crawford once participating in a Houston area branch of this organization before being drafted by the Rays. Next to them is the Rays Wheelchair Softball team, which is currently ranked 7th in the nation, and is the reigning National Champion in Division II. Then you wander on down to the SABRE table, which asked Rays fans to find Rays players listed in a word search puzzle today for a prize. After that you wandered around the fencing of the infield to come upon the Ted Williams Museum table where a raffle went on all day for awesome autographed and limited edition photos and keepsakes from baseball and the world of boxing. Famous boxing corner man Angelo Dundee spent several hours here today signing autographs and taking pictures with Rays fans. 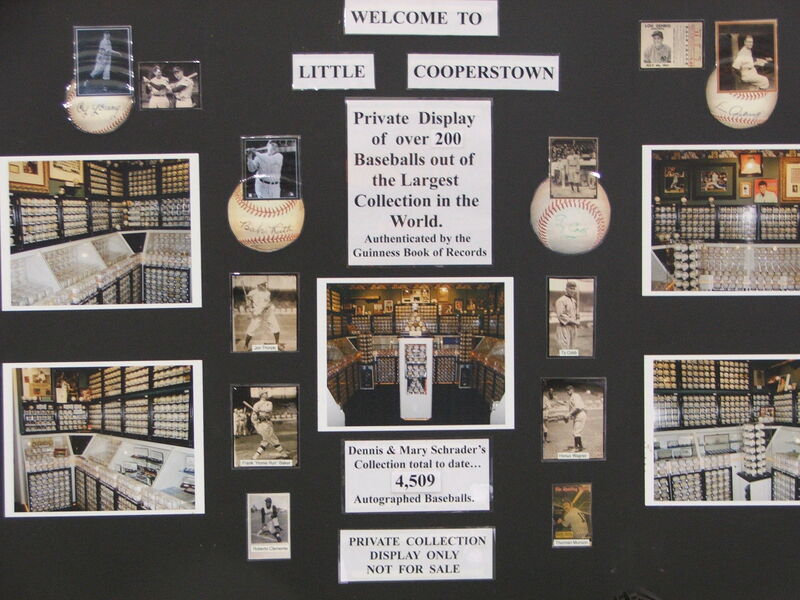 The you came upon ” The Little Cooperstown” baseball display. 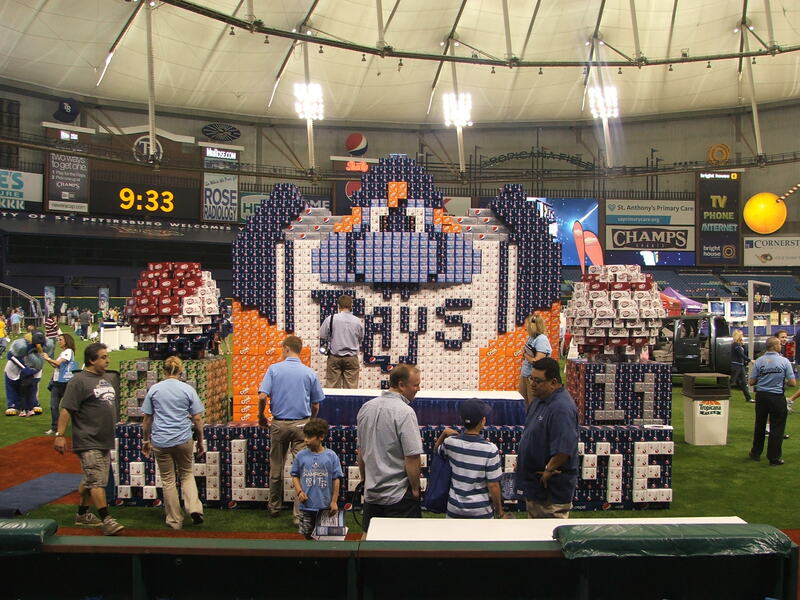 It is a display sponsored by Rays season ticket holders, the Schrader family that holds over 3,500 baseballs in its collection. It is currently the “World’s Largest Privately Owned Baseball Collection”, and features a unique Rays calliope. Then you come upon one of my favorite Rays collectible displays, the McKenney family Collection. This is a very unique collection because it hold a baseball signed by every coach and player who ever put on a Rays uniform. 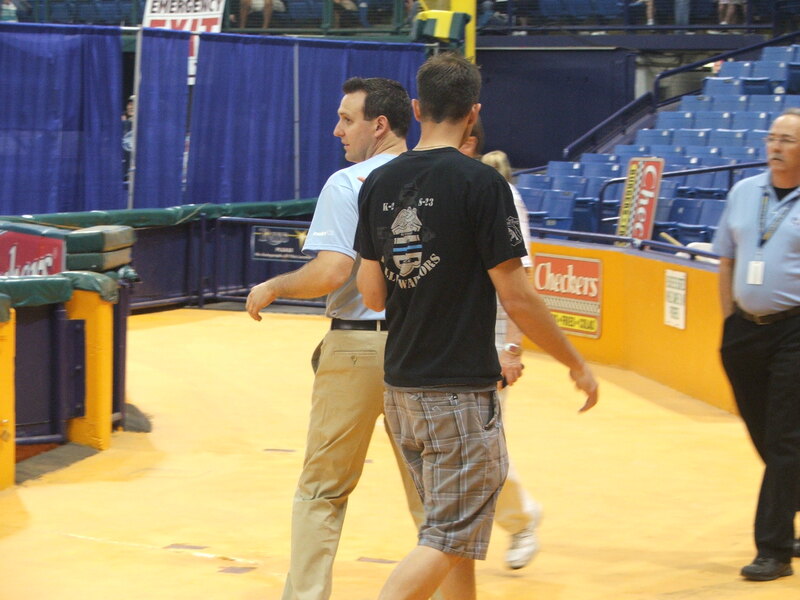 It is also the pride and joy of Jeff McKenney, who fans at the Trop know affectionately as “The Sign Guy”. 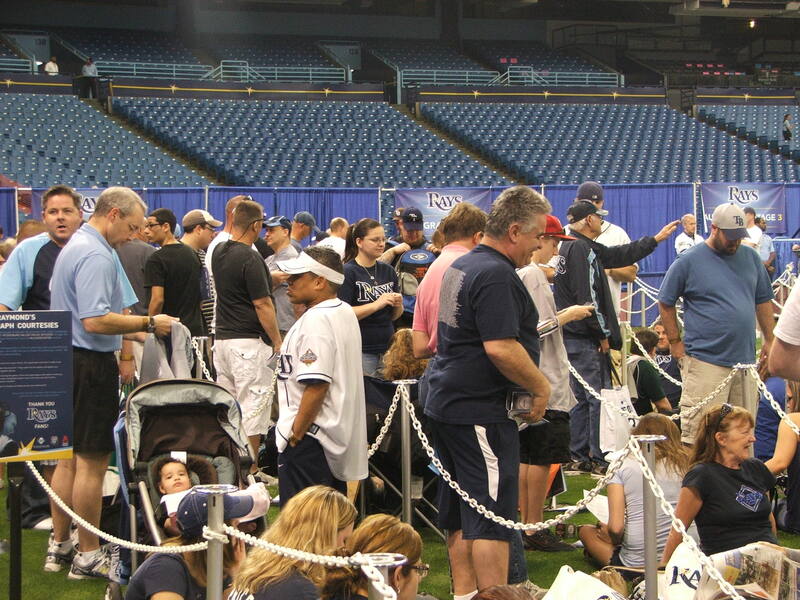 McKenney also has an amazing banner that he started that he has also gotten almost every Rays player to sign. 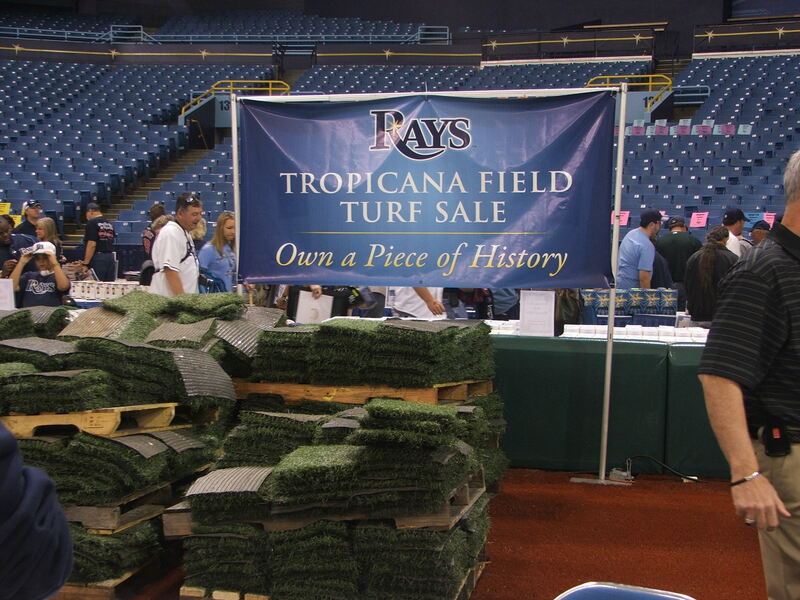 The banner and the collection are a great look into the history of the Rays, and some date even before the first game in 1998. But over in the left field Bullpen area is the first place you would find me today. 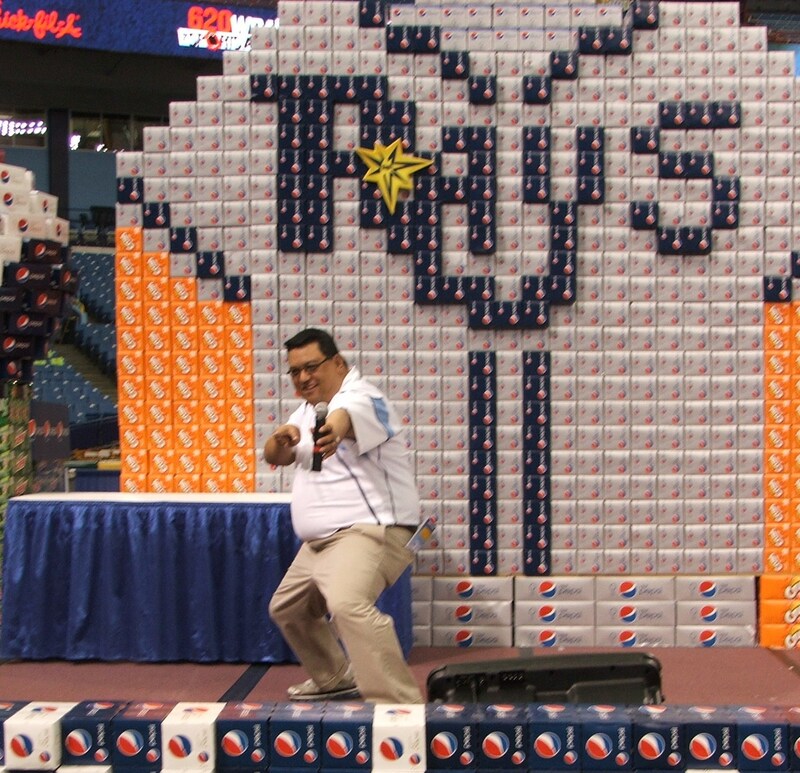 At the Rays /Pepsi Fan Wall of Fame. 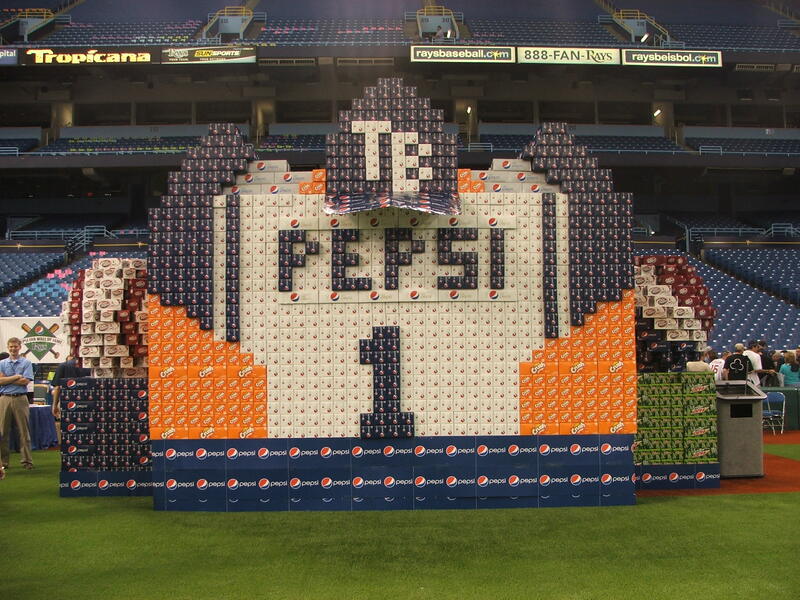 Pepsi TSM Joanna Moore outdid herself this year with an amazing piece of sculpture using the new logo Pepsi 8-pack cartons. As usual, it was one of the most anticipated construction events at Fan Fest. 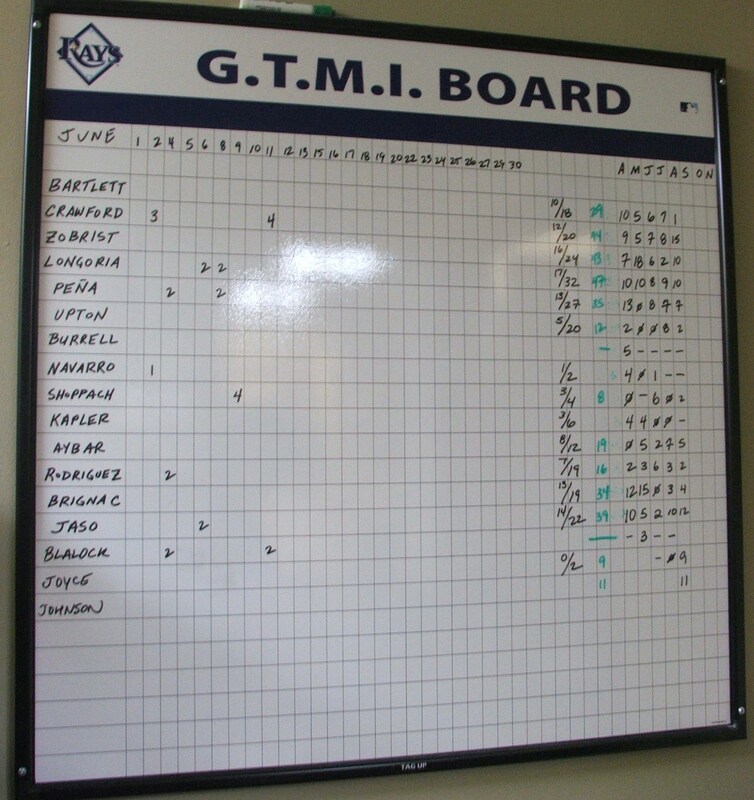 The event held it’s 2009 Induction Ceremonies at noon, and 5 new members were inducted onto the wall. There are now 100 members of this elite fans display that is located in the Ted Williams Museum on the North wall. If you strolled between the walls of the Corona Beach Club you saw the fans that were taking their pictures with the 2008 American League trophy. 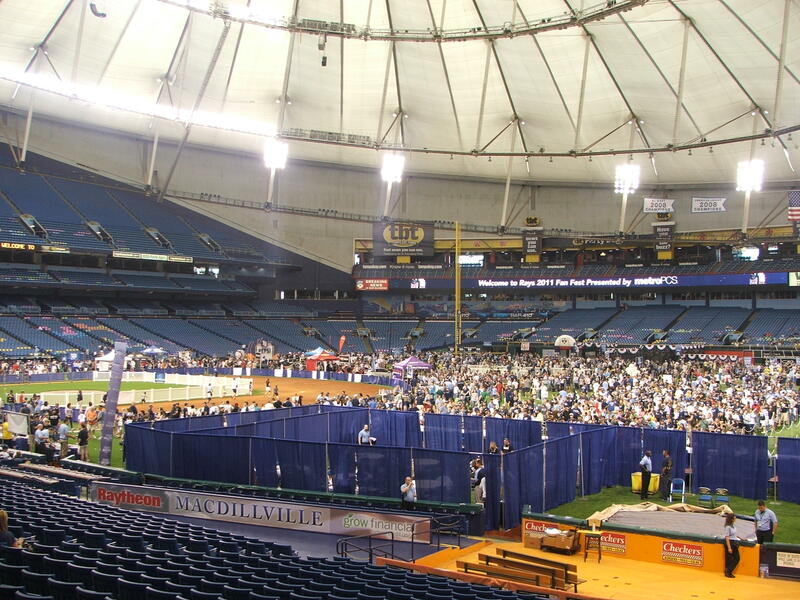 To the right of them beyond the left field tunnel was the Rays Season Ticket opportunity where fans got to take their picture with two Rays players at the same time. Players like James Shields, Fernando Perez got things started at noon today and were followed by B J Upton and Matt Garza, Dioner Navarro and Andy Sonnanstine, Jason Bartlett and J P Howell, and Jeff Niemann and Troy Percival closed out the event at 5 pm. But it was the areas lining the left field walls towards center field that had the most action today. That was the location of the kid’s game area where speed pitching and hitting rules the day. But if that was too much for you right now, there was a three-story little sluggers zone with wiffle balls, and a few of them even made it over the big white monster wall today. You then would stroll down to the big league batting cages and the wiffle ball home run derby event, where the little one were fed balls from a machine and aimed for the wall that resembled old Ebbet’s Field in Brooklyn, New York. 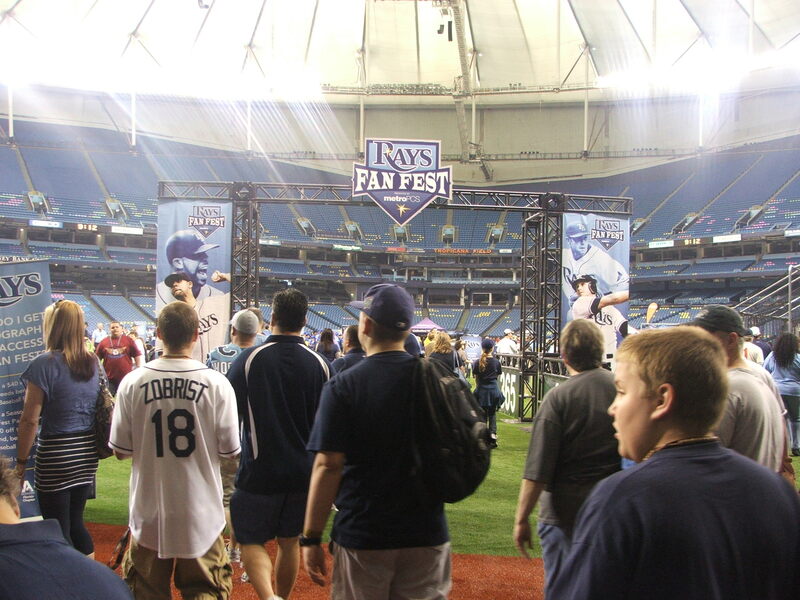 One of the most popular photo opportunities was at either of the Rays enlarged baseball side displays, or the cutout where you could put yourself in the Rays home plate celebration. It has two cut out points to put yourself into the action. All in all the Fan Fest had its ups and downs. The autograph areas were saturated as usual by fans and some did not get to the front before the signing time was over for the players. That has happened in the past, but with the increased attendance today, you had to be in the right place at the right time today to get everyone you wanted. That is one of the sad points of the day. Some players like Carlos Pena did not arrive on time, but he stayed beyond his time and signed for the fans. Scott Kazmir also sat down for an additional 15 minutes after his was done signing since he was the last one signing today. But as I was leaving, Rays catcher Shawn Riggans was still out by the right filed foul pole signing autographs and taking pictures for fans. Shawn remarked that “It was part of his job to show the fans we care.” I sat there chatting with Riggans for a few minutes before leaving, and he was still in that same spot signing for the young and old fans alike who came up to him. 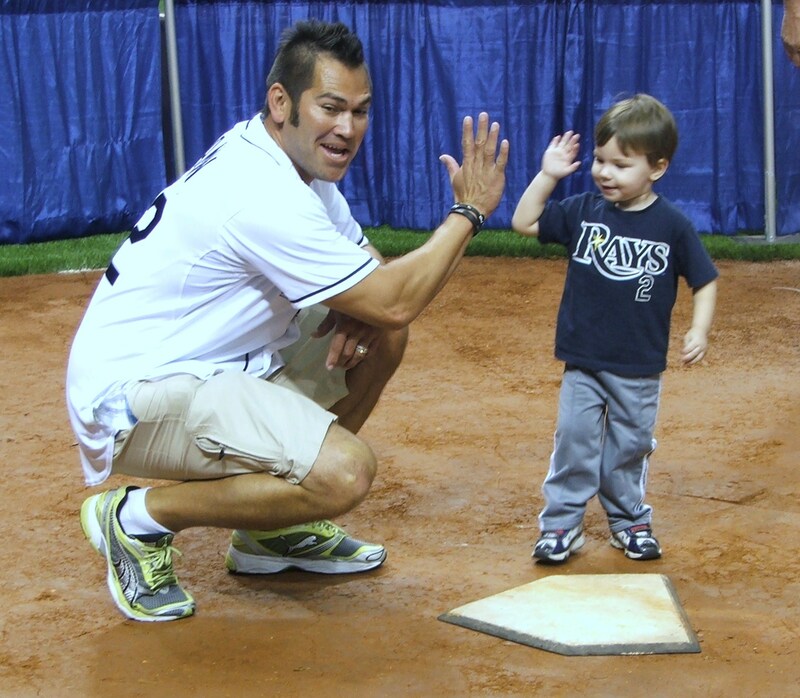 The Fan Fest was about family, and the Rays players also brought out family members today. Jason Bartlett and his wife brought their infant girl to the Fan Fest today, and she slept through the entire bit of noise today. Carlos Pena also brought his daughter up on the signing stage with him and she was sitting their making designs throughout the signing hour. All in all, the event was a huge success for the team. 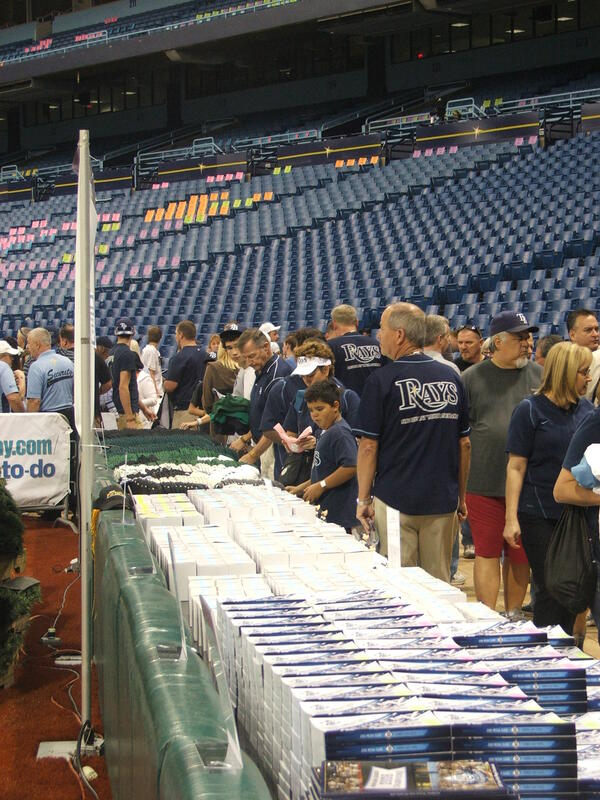 Some people grumbled about the autograph lines, and others did not understand that the $ 10 autograph donation for a wristband to stand in line for an autograph was to go to the Rays Baseball Foundation which provides money and scholarships throughout the Tampa Bay area. The group also renovated local Little League fields and donates their time and efforts in Habitat for Humanity and the local homeless shelters in the area. But he crowd was here in force, eating, drinking and enjoying themselves as the filed in and out of the stadium. 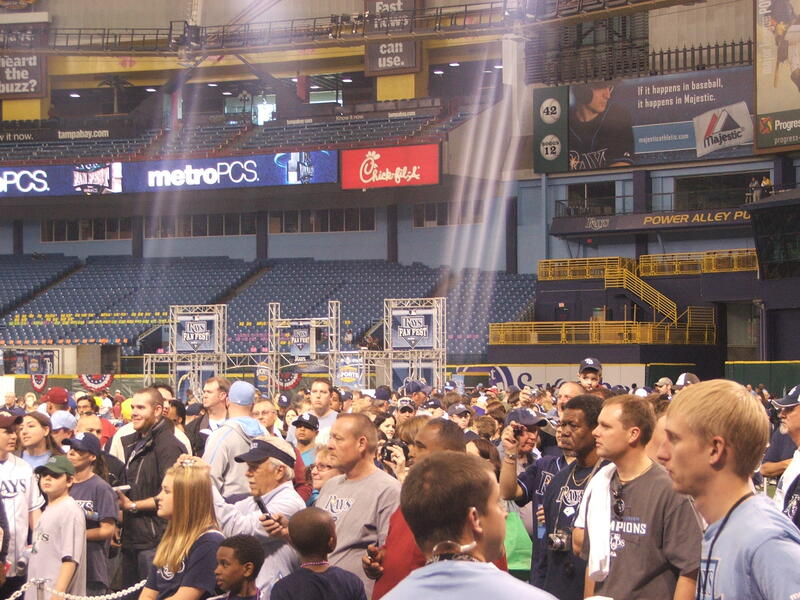 Even with all the pressure on the Rays to continue their winning ways, the players and the Rays management teams can grow in confidence by the display of the fans turnout for this event. I have a few suggestions for 2010, but I will leave that for another time. 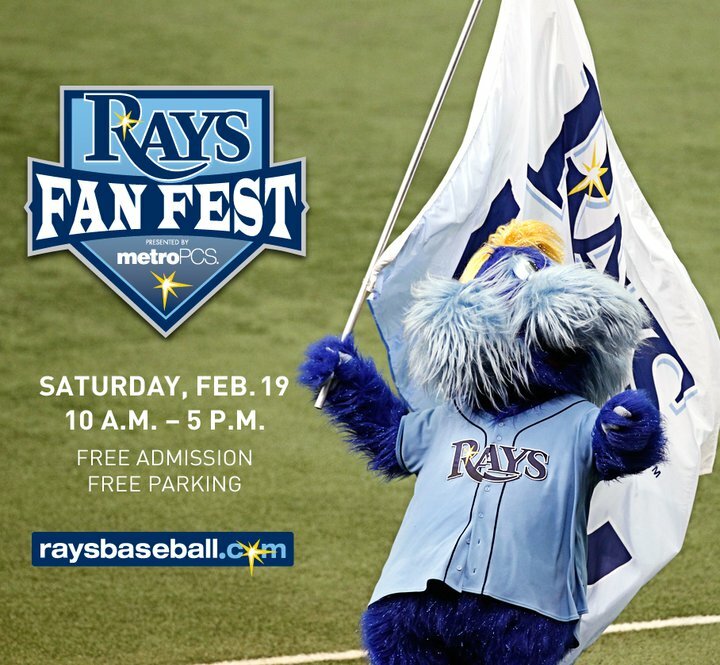 It is time to rejoice and also relax and take in all the positives of the 2009 Fan Fest and show some real deep love to the Rays on this Valentines Day. loudspeaker and on the Jumbotron. 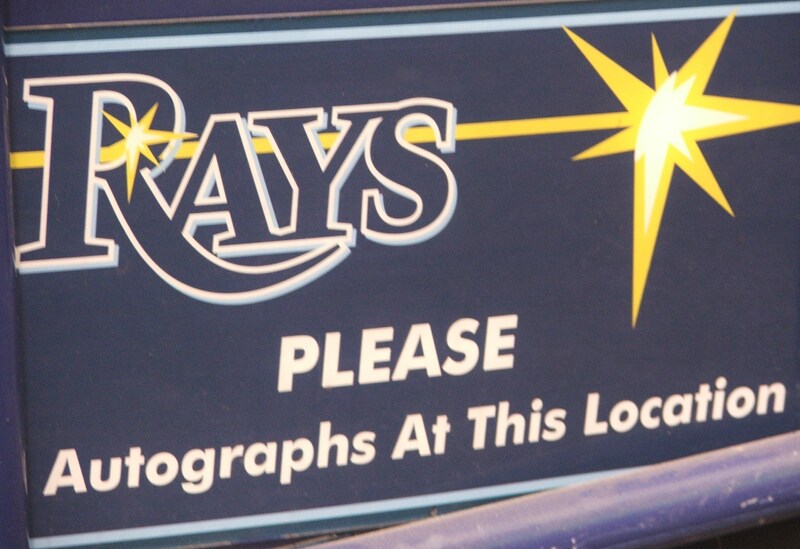 photo opportunities for Rays Season Ticket holders at the event. Ticket Holders Line- Photo Only)- Jason Bartlett, J.P.